Vanitha, beiing the most celebrate family magazine is being widely read by the malayali community around the globe. Being a trusted publication from the house of Malayala Manorama, the magazine is exclusively designed catering the need of all generation people. 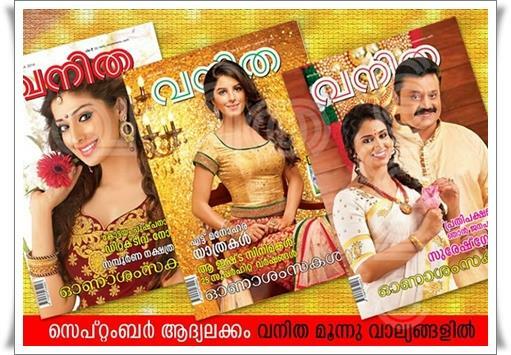 The 1- 15 September edition of Vanitha featuring Suresh Gopi, Lakshmi Rai and Isha Talwar on cover pages have been published. The highlight of the first volume of September 2014 issue of Vanitha will be the interviews with interviews with Suresh Gopi, Lakshmi Rai and Isha Talwar. This Onam edition comes in three volumes richly packed with interesting contents which would add more flavour to this festive season. Readers would get extra stuff to give maximum respect to their time. In an exclusive chat for Vanitha, actor Suresh Gopi reveals his re entry into films, his family life and political interests. Suresh Gopi who is much favourite among the mass speaks about the recent controversies and his political affairs. He shares his thought along with his wife Radhika. Deep from the heart, actress Isha Talwar opens her mind to the readers. Isha who become favourite among the malayali audience in a short span of time shares her interests, acting career and future life. Even not being born as a Keralite, Isha is happy to get the extreme support from the movie enthusiasts. The chit chat with Isha would enable the readers to get the inside life of the young beauty. Rai Lakshi who has mesmerized the moviegoers with her charisma and acting skill is excited to give life to prominent characters in malayalam films. She talks about her upcoming movies and support given from the film industry. Celebrities like Dileep, Indrajith, Rima Kallingal, Aju Bobby George, Hibi Eden, Ranjini Haridas and Bhama share their old memories. Readers would get a rare chance to know the childhood life of the people who have made their presence in various fields. Non Keralite serial actresses are featured in the current issue of Vanitha. They speaks about the excitement and joy in acting serials and the overwhelming response from the family audience. The actresses who give life to matured characters in popular malayalam serials are mostly non keralites. An interesting article with photographs of trend setting sarees has found their place in the September issue. The new designer sarees will take the readers to a different world. Sarees which are mixed with various colours are well liked by the present generation women. Meera Nanda brings delicious Onam Sadya while her mother Maya and Grand Mother Valsala are also featured. Kottayam Pushpanath who has made his name through horror novels tells more on his characters and detective stories. 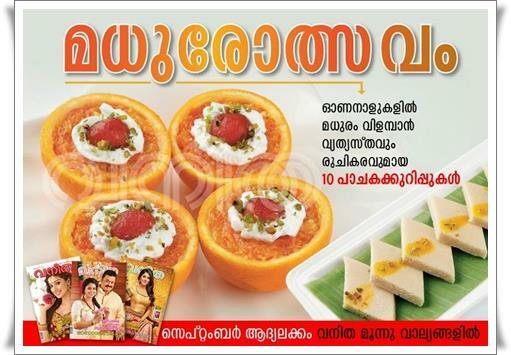 Also find 10 Special recipes to make this Onam yummy. An array of articles on Onam and other stories and featured in this Onam special edition. With a circulation of more than 7 lakhs copies, Vanitha is well recognized for its inventive contents. Articles on various topics like kids care, Style & Trendy, Astrology, Travel, and Health are also seen in this issue of Vanitha. Each issue of Vanitha is highly treasured and read by celebrities during their leisure time. Printed in multi coloured pages, 'Vanitha' is highly recommended for those who wish to stay young and know about the changing lifestyle.